The Heaphy Track is a popular hiking route on the South Island of New Zealand. It is best known for its beauty and diversity. It has been classed as one of the nine Great Walks in New Zealand and is located within the Kahurangi National Park. At over 80 kilometres long the track takes between four to five days to walk. It connects the Aorere Valley in Golden Bay with Karamea on the North West coast. It is named after the explorer first known to visit the area, Charles Heaphy. Ever since the improvements made to the track in the 1990s it has been a popular hiking (or tramping as it is known in New Zealand) destination for thousands of people every year. It can be walked in either direction and is well signposted. Though every effort is made to keep things as safe as possible some areas are steep and can become muddy so it is recommended that trampers have at least an intermediate level of fitness. As it is classified as a walking track all rivers and major streams have been bridged, making it well suited for most people. One of the reasons the Heaphy Track is so popular is the diversity of landscapes along the track. Each 20km section offers something different. Forests full of beautiful beech trees make way for expansive tussock grasslands. You will also come across nikau palms, huge rimu trees, rivers, lush bushland and the roaring sea of the West Coast. There are also spectacular mountain views from the highest points. The diverse landscape is not the only attraction of the Heaphy Track. Around halfway along the track is the Gouland Downs area; known to be a home of the great spotted kiwi. Even if you are not lucky enough to spot one you are more than likely to hear the distinctive call of the male which is a shrill whistle sounding like ‘kiwi’ and the low ‘churr’ reply of the female. Nature lovers may also be interested in the Powelliphanta; a carnivorous land snail often found around Heaphy Hut on damp nights. The Heaphy Track is not just popular with hikers; it is also a destination for mountain bikers. Anyone looking to mountain bike on the Heaphy Track should be aware that due to its national park status mountain biking is only permitted during certain times of the year. To complete the track on a bike takes 2 to 3 days. With the Heaphy track being so popular with trampers, mountain bikers and other tourists there is accommodation available in the nearby towns of Takaka, Westport and Nelson. One of the best places to stay is The Station House Motel, Collingwood which is only 40 minutes from the start of the track. One great advantage of staying at the Station House Motel is that they offer pick up and drop off services at the start of the track; perfect for those worn out after some rigorous tramping. With Maori tribes known to have settled nearby as early as the 16th century, the Heaphy Track is the perfect place to feel closer to the history of New Zealand at the same time as soaking up the atmosphere and amazing views. Definitely recommended as one of the best tramping spots in New Zealand. After starting The Heaphy Track at Brown Hut, you’ll head upstream for about 170 metres before crossing a bridge over the Brown River, then a small grass flat before winding up a well-defined track (a route which was once surveyed for a road). The route then gradually climbs through podocarp and beech forest to Flanagan’s Corner (the highest point on the track at 915m (3,000 ft). Four hours into your trip you will reach Aorere shelter. From here, the Aorere Valley is seen extending northwards and on clear days it is possible to see the conical peak of Mt Taranaki in the North Island. From here, it’s a gentle stroll to Perry Saddle Hut. At around 900 metres (2,800 ft) above sea level this is the highest point on the track. A deep pool nearby in Gorge Creek offers a rfreshing swim – not for the faint-hearted, but all feelings of fatigue will vanish the moment you touch the cold water. This day is alot easier than the first with only 4 hours of walking. You pass through kamihi and beech forest before journeying through the wide expanse of tussock covered land known as the Gouland Downs, which can be disorientating when the mist lowers. The track then meanders easily down to Cave Brook, before coming to the ‘boot pole’, which is sure to bring a smile to your face. This pole wears a variety of old boots, ‘ on which trampers over the years have tied their old boots, if you have an extra boot in your pack then please feel free add to the collection! Nearby you will pass “the enchanted forest”, a small patch of beech grows on a limestone outcrop which has escaped erosion. This area is worth exploring. Take a torch and see if you can find a cave spider. The track crosses one of several limestone arches, which are the remnants of old caves. Nearby, a small waterfall flows out of another cave passage. 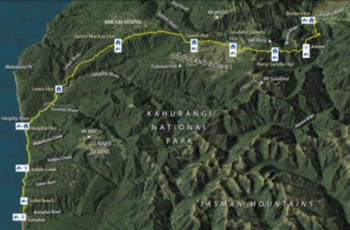 On your way to Saxon Hut you will pass the oldest hut on The Heaphy Track, the Gouland Downs hut. The historic Gouland Downs Hut is about halfway and provides a good spot for a lunch break or to shelter in case of bad weather. 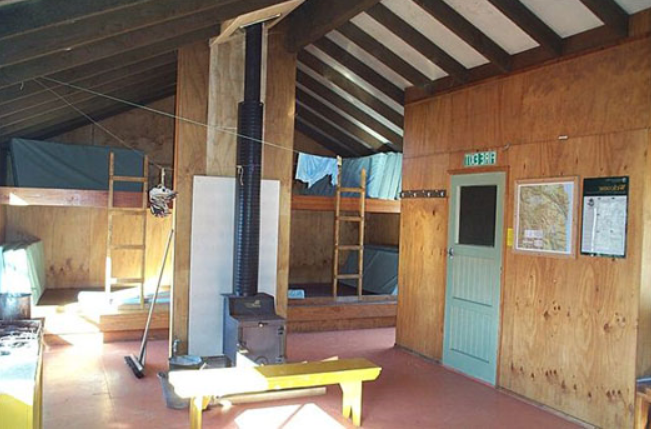 The Gouland Downs Hut has an excellent fireplace, but does not have gas-cooking facilities. Most hikers continue on through some flat tussock country to reach Saxon Hut, nestled at the end of the downs. The Saxon Hut is the newest hut on the Heaphy Track and is named after John Saxon, who surveyed the track in 1886. Mostly flat walking today throughbeech forests, stunning tussock, rivers, rock outcrops, creeks and you’ll cross the demarcation line between the Tasman (Nelson) and the Buller (West Coast) districts. A section on Mackay Downs floods in extremely wet conditions. This is a 70 m piece of the track across a wetland and a bridge. It becomes impassable and quite dangerous. Walkers should wait for the water to recede. The track now continues along the edge of Mackay Downs to James Mackay Hut, winding in and out of several small streams, just before they tumble off the downs and fall to the Heaphy River on the left. The vegetation is alternately tussock field and shrub-fringed patches of beech forest. Small creeks dissect the landscape and the pink granite sparkles and crunches beneath your feet. James Mackay Hut is situated just above the track on an open terrace. The Heaphy River mouth and Tasman Sea can be seen from here, 15 km to the west and 750 m below. It is named after the explorer who first pressed for a bridle track to be established between Collingwood and the West Coast. Beyond James Mackay Hut its all downhill through beech forest at first but soon into taller, richer and more diverse forest indicative of the West Coast. 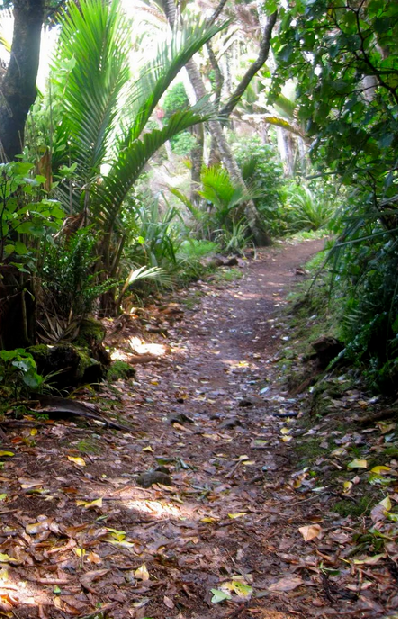 The track descends gradually to the Heaphy River through beech and sub-tropical podocarp forest, surrounded by a rainforest of kowhai, cabbage trees and nikau palms. A detour to see one of New Zealand’s biggest rata trees is definitely worthwhile. Occasional tantalizing glimpses of the Heaphy River below are seen through the forest. The sounds of rushing water grow louder and suddenly the hut appears at the junction of the Heaphy River with the smaller Lewis River, where you’ll encounter the infamous West Coast sandflies. From Lewis Hut, head back up the track for a short distance and cross the Heaphy River, via the new 148.4 metre suspended deck suspension bridge which is the longest ever built by DOC. The track continues by following the banks of the Heaphy River, passing giant kahikatea, rata and rimu trees. Glossy-leaved shrubs perch precariously in the tall trees, flourishing in the abundant light. In season, you can see the Earina and Winika perching orchids. In dry spells, the sluggish river meanders along peacefully, but in times of heavy rain especially when it’s high tide, sections of the track and bridges get flooded. As you follow the track towards the mouth of the river, nikau palms become more common, the sea’s incessant roaring grows louder and, in some conditions, small waves can be seen running upriver. The Heaphy Hut is situated close to the river-mouth and has prime coastal frontage but thankfully it is situated far enough back from the sea to be spared the worst of the winds. This is a truly magical spot and a great chance to experience the famous Heaphy sunset! The majority of today’s hike is through forest; although there is some beach walking. At the mouth of the Heaphy River water surges out through a narrow gap into the sea – in-coming waves halt the flow; and the resulting tumultuous churning of salt and fresh waters is spectacular. Just beyond Katipo Creek is Crayfish (Koura) Point. There is no high tide track over the point and where the track follows the top of the beach can be impassable two hours or so either side of high tide when sea conditions are rough. 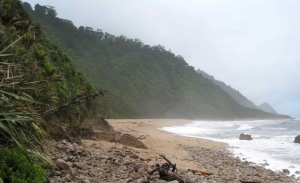 Check tide tables in the Heaphy Hut or Kohaihai Shelter before proceeding over this section. The track south to Kohaihai is through forest although beach walking is possible in some places. Some of the small streams are not bridged and can be dangerous after heavy rain. 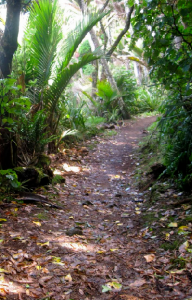 The forest has rata and karaka trees, many vines and groves of nikau palms. Be careful of the stinging nettle that grows in places. You’ll soon reach the Scotts Beach clearing. The clearing here is a great spot to rest before climbing the Kohaihai saddle and then down through wind-blasted shrubs to a bridge across the Kohaihai River. The track follows the riverbank for 400 m to Kohaihai carpark where there is a shelter and phone. For more information visit The Heaphy Track website.